You were an Art Director and graphic designer before you became an author. How did that switch come about? I lost my job in 2009 during the recession, like so many other people who were negatively affected, and decided to turn what some might see as a negative setback into an opportunity to follow a life long dream. My youngest daughter was devouring the Percy Jackson novels at the time. Being a first generation Greek American, I thought about how much I’ve always wanted to be an author, even though I was pushed by family as a teenager to do something they deemed more practical. I took the chance I had, for better or worse, to freelance and dive (pun acknowledge, not intended) into writing. I knew virtually nothing about writing a book. I had written poetry for years, though, so I set off for my local library and read as many books on the craft as I could carry, dedicated to changing my career and learning everything I could. The rest is a long string of workshops, rejections, and shelved manuscripts until I found myself here, debuting my first novel. Congrats on your debut, DIVE SMACK! Tell us about it and what inspired you. Thank you. 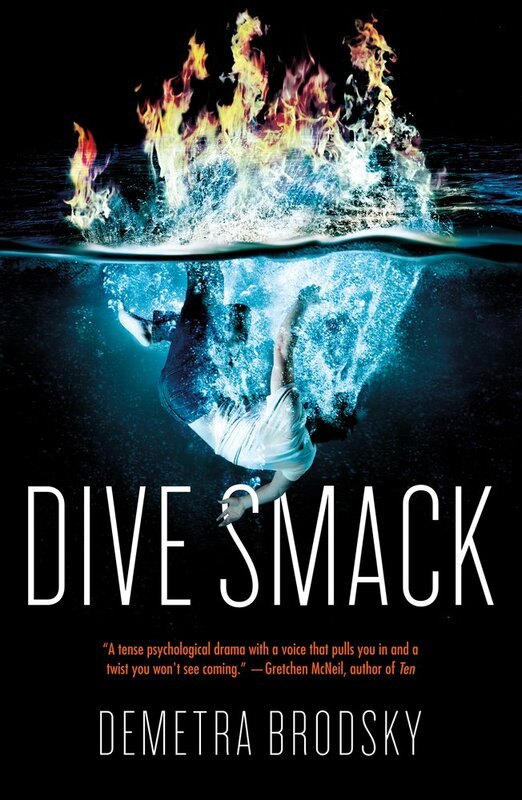 I’ve always been drawn to stories about dark family secrets, but the seminal idea for DIVE SMACK came from my friendship with 1992 Olympic Springboard Diver, Karen LaFace. I was working on an idea about a boy looking into his family history and thought, Wow! Springboard diving would be a great metaphor for this character’s life spinning out of control. There’s a little more to it than that, but it would spoil the twists in the novel to dive in deeper into the inspiration. I love this question. I’m very visual, both as a designer and a writer. One of the first things I do is set up a Pinterest board for each novel I’m working or think I might want to work on. 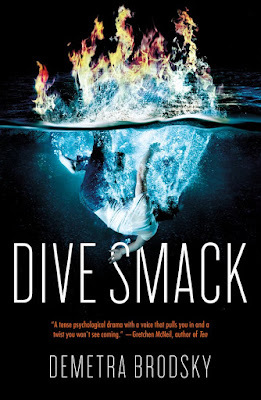 You can find the DIVE SMACK Pinterest board here. 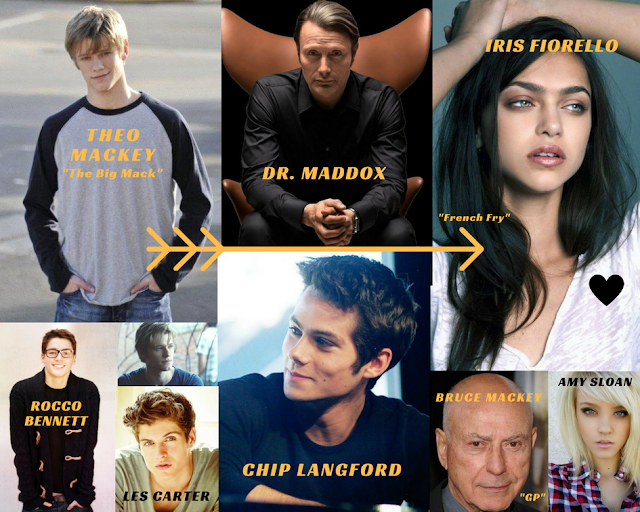 But right off the top of my head, I’d say Lucas Till for Theo, Mads Mikkelson for Dr. Maddox, and Dylan O’Brien for Chip Langford. I even made a dream cast vision board for you to share with readers. 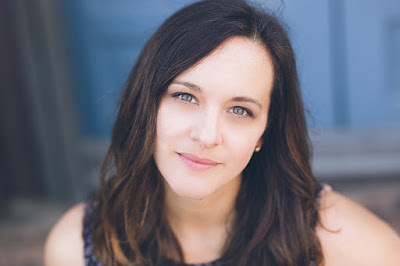 A favorite classic YA novel and a favorite recent YA novel? The Classic YA is easy. THE OUTSIDERS. It was the first novel that made me think about becoming an author as young teen. I loved that book so much that we have a dog named Ponyboy Curtis, who is as sweet and sensitive as his namesake. More recently, BERSERKER by Emmy Laybourne (Feiwel & Friends 2017) who also wrote MONUMENT 14, is one of the best YAs I’ve ever read. It’s stunning and breaks all genre boundaries in the most spectacular way. One part mythology, one part western, one part thriller: I devoured it in two days and then reread it again to make sure I hadn’t missed anything. You have to check it out. I recommend it to everyone. I would tell my younger self, as well as aspiring authors, to get out and enjoy life. I have a very strong drive to succeed and will work myself senseless in pursuit of a goal. But life keeps going around us while we work. Taking precious opportunities to get out and travel and go adventures shouldn’t be seen as an interruption to writing, but as an asset that keeps new ideas flowing. We can’t write in vacuums. I’m a first generation Greek-American and bilingual. I went to Greek School for six years after regular school, just like in that movie My Big Fat Greek Wedding. I didn’t grow up in a houseful of books. In fact, my mother can’t read, so libraries and librarians were very important to me in my young life. Without them, I don’t know if I would have such a strong love for reading and writing. When I found out DIVE SMACKwas a 2018 Junior Library Guild Selection, I broke down and cried. That designation means so much to me and I’m extremely grateful my debut novel was chosen. I feel like I spend 50% of my time online these days and I would love for readers to friend me on Instagram: @demebrodsky or Twitter: @demetrabrodsky. I also have an author Facebook page, as well as my website http://www.demetrabrodsky.com. Love the idea of creating a Pinterest board for each story idea! And Dive Smack sounds so intriguing. Loved this interview! I've had this book on my TBR since I first read about it. I love the cover and the symbolism makes me want to read this book.